You read that headline right. Chinese internet giant NetEase will soon be selling pork. NetEase operates Blizzard's World of WarCraft in China. It funds and publishes its own online massively multiplayer online role-playing games, on top of running a highly trafficked internet news portal. It's also into the business of raising organic free range pigs. Chinese internet companies often wear more than one hat. Companies such as NetEase, Tencent and Sina have their fingers in a buttload of pies. For example, Tencent operates various social networking sites, mobile messaging applications, an internet news portal and, of course, video games. Tencent has also been gingerly dipping its hands into offering insurance and mobile payment options. Basically, Chinese internet companies are hugely diversified. Back in 2011, when NetEase founder William Ding announced the company would be spending $328 million on breeding and raising pigs for pork, he was laughed at. The idea was preposterous. A successful internet company facing tough competition in a crowded market was going to invest in pigs instead of coming up with a new product. NetEase's venture into pig farming is supposedly to come out with responsibly raised organic pigs. 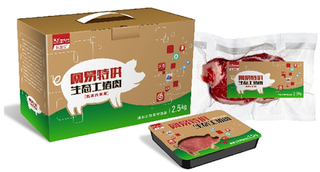 Later that year, NetEase had told reporters that the farm would yield results and that NetEase pork will be available for purchase within a year. Sadly, that never happened. In 2012, photos appeared on China's largest microblog Sina Weibo showing what NetEase pork might look like. Instead, it turns out, it wasn't a real photo of the finished product, but instead of what was an internal test. NetEase had taste-tested the results of its farm on its employees and, according to reports, it was a success. Now, three years (some reports say five) into pig farming and with unknown amounts of money spent, NetEase pork is finally going to be a thing. That's not to say it's vaporware. The farm exists, the pigs exist, and internal pork vouchers for employees exist. It's just that the pigs haven't been turned into deliciously succulent porky goodness yet. Sadly, only about 100 players will win the right to chow down on some NetEase-branded pork. Keep in mind that they will not be receiving cooked pig meat, but instead raw meat. They'll have to cook it themselves. On top of that, Kotaku has reached out to NetEase and yours truly is now on the waiting list for NetEase pork! We will update when we receive our package of tasty bacony pork choppy goodness. I look forward to showing ya'll some of my favourite recipes.